Another illustration of the reciprocal development of thought and language is included to demonstrate how one graphic can serve as a springboard to another. Just as in the Introduction, the original Venn Diagram of Vygotsky encouraged Joan to graphically continue in order to grasp the dynamic relationship of thought and language (see Figures 2, 3, and 4 of the Introduction). So, too, did others continue to expand on their own understands with further drawings. While the concept illustrated in Figure 3 shows the reciprocal nature of the relationship of thought and language, it also includes the product of the process, which is word meaning. The process of thinking and speaking and thereby generating word meaning is also depicted in Figure 4, with the addition of the sociocultural environment that also affects what we think and come to know. In addition, this graphic demonstrates the expanding nature of our learning. As we think and discuss through our experiences with others, our learning expands and deepens our knowing and our development. Experiencing these graphics has expanded students’ understanding also. We have used them in various settings, which has generated other ways of thinking about the concepts. For example, after seeing the previous graphics an international teacher in one of a graduate course immediately drew a whirlwind on her paper (Figure 2.1). When she showed it to her colleagues in class, at first they did not understand her ideas. She began by explaining to them. Well, you know how new thoughts and perhaps vocabulary, comes to us. Often times these ideas are a challenge to our long-held assumptions. It is contrary to all our beliefs to that point. It is like we had an idea, and all of a sudden someone tells us an anti-idea. The anti-idea churns; it tries to germinate; sometimes it explodes. We struggle and grapple with it. It triggers anger, defensiveness, and resistance. The other international educators in the graduate class nodded their heads in agreement. They understood the struggle with now ideas and vocabulary; with new thought and language. The woman who drew the graphic continued. 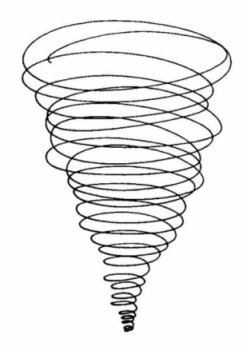 In Harriet’s version of the open whirlwind, a new idea can open our minds to a different perspective if we are receptive to it. This new idea first expands our thinking, and then narrows as we begin to make sense of it. The idea expands again when we share what we have learned with others. After first sharing by drawing her conceptualization of thinking, Harriet, an ESL teacher, who grew up in the US and has lived the last 20 years in Czech Republic, then shared her ideas on how knowing about is different from experiencing. Her colleagues asked her for some examples. Swimming, cancer, and reproduction,” she replied. “There is a big difference in knowing about those three things than experiencingthem. Another example was Helen Keller. To know about ‘water,’ she needed a knowledgeable teacher who gave her, not only the experience, but also the language. Harriet continued by sharing the story of a young immigrant student in her class who had horrific experiences with family in their war-torn homeland. The young student had experienced fear, pain, and hate. However, she needed the language to express her past life in order to grow into her new one. Harriet shared how the girl’s thoughts about fear and safety were much deeper and truer than her classmates’ due to her own personal experiences with war. Harriet’s knowledge of the Vygotskian concepts of thought and language enabled her to support the young victim as she healed from her past, and acquired language to express her experiences. As she talked, she walked to the whiteboard and quickly sketched the following braid with three different color markers. Harriet used red for thought; green for experience; and blue for language (Figure 2.3). Through her talk and her illustrations, Harriet showed that she had internalized Vygotsky’s conceptualization of the relationship of thought and speech, and how it is grounded in the totality of experience, or the sociocultural context.